Wotofo Flow PRO 5mL Replacement Bubble Glass TubeThe Wotofo Flow Pro Glass Tube is a 5mL replacement..
Wotofo Flow PRO 4mL Replacement Glass TubeThe Wotofo Flow Pro Glass Tube is a replacement glass tube..
Wotofo H4 18650 Battery Case - ClearThis is a carrying box for your 18650 batteries from Wotofo. Thi..
WOTOFO Vape Tool KitThis Vape Tool Kit from Wotofo provides a complete and full coverage of all your..
WOTOFO Agleted Organic 10pc Cotton 6mm (for Profile RDA)Time to ditch the tedious process of ripping..
Wotofo Pre-Built 20ft Wire SpoolsThis new line of quality wires from WOTOFO are the same with our po..
Wotofo Mesh Style 10pc CoilsThis rebuildable mesh sheet, from Wotofo, is an improved and larger-size..
WOTOFO Agleted Organic 10pc Cotton 3mmTime to ditch the tedious process of ripping, cutting, twistin..
Wotofo RECURVE Squonk Box MODIntroducing the follow-up collaboration between Wotofo and Mike Vapes, ..
Wotofo Flow PRO SubTankNewly upgraded from the original and popular flavor monster, Flow Sub-Ohm Tan..
Wotofo Warrior RDATime to reveal the "concealed behind the black" operation between Wotofo and the s..
Wotofo Flow PRO MESH 5pk CoilsIntroducing the Wotofo Mesh Coil, the coil that outperforms traditiona..
Wotofo & Rig FLUX KitPresenting the most ideal starter kit, the Wotofo & Rig Mod Flux Kit! 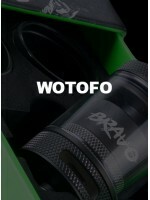 T..
Wotofo Pre-Made 10pc CoilsUsing pre-made coils is the best way to avoid tedious time-consuming ..
Wotofo Stentorian V2 Squonk Refill Bottle 30mLNew V2 Squonk Refill Bottle by Wotofo makes it even ea..
Wotofo Recurve RDAWotofo Recurve RDA is a recent collaboration between Wotofo and the well-known You..
Wotofo Nudge Box MaterialL:Plastic Color:Carbon fiber Thread:510 Thread Product size (L x ..
Wotofo FLOW 0.25 Ohm 5pk Coils1 x Wotofo FLOW 0.25 Ohm 5pk Replacement Coils (Rated 35-60W)..
Wotofo Stentorian AT-7 Box MODThe AT-7 Box Mod by Stentorian and Wotofo was designed in California a..
Wotofo Stentorian RAM BF Squonker MODThe Wotofo Stentorian RAM BF Box Mod is an elegant wood/resin s..
Wotofo FLOW Sub-Ohm TankEasy top filling & adjustable bottom airflowSilver-plated 510 pin for be..
Wotofo Steam Engine Coils available in 5 PackAvailable in:Clapton - .7 ohm, 30-50wParallel - .25 ohm..
Wotofo Steam Engine StentorianThe Steam Engine Sub-Ohm Tank is the newest heavy hitter from Wotofo, ..